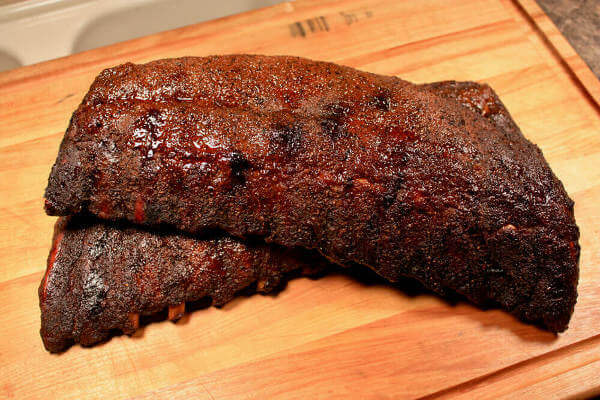 Smoke a slab of Memphis style pork ribs and serve them the traditional way...without sauce. Cooked right, these ribs will have a slightly crispy bark on the outside, and juicy, tender meat within. Use a trimmed sparerib slab for this recipe. The St. Louis style trim slab is a consistent thickness throughout so it cooks evenly. It also looks nice for presentation and on the plate. Baby back ribs would also be fine to use, especially if you prefer your pork a little leaner. Baby backs will take a bit less time in the smoker too, because of their leanness. Since these ribs are typically served without sauce, the flavor of the dry rub is the star. 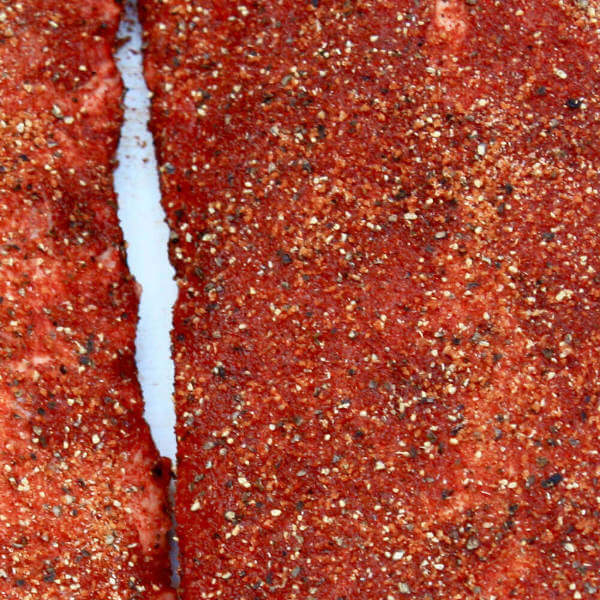 This great tasting rub enhances the flavor of the pork without being too spicy. The only salt in this rub is the tiny amount that's in the celery salt. Season each slab with a teaspoon of kosher salt before spicing them up with the rub. Combine the ingredients and store the dry rub in a tightly sealed container until needed. This rub will keep well for several weeks if stored in a cool location. 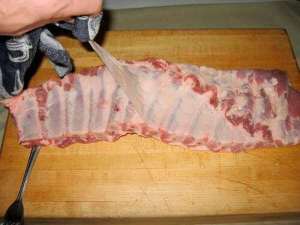 Trim any loose bits of flesh and excess fat from the slab of ribs. Remove the membrane from the bony side of the rack. To do this, gently separate the membrane, otherwise known as the "fell", away from the ribs. Grasp the loose flap using a towel for a better grip, and carefully peel it off. It might take a few tries to get it all removed, but it's worth the time and trouble. The fell is often tough when cooked, plus it creates a barrier that prevents the rub from seasoning the meat on that side. Now that the membrane is gone, scrape off what you can of the thicker deposits of fat. 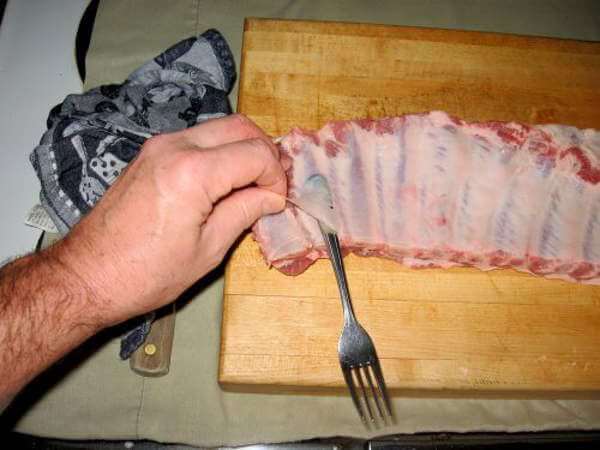 A stout teaspoon works well for this, and fits nicely into the grooves between the rib bones. Season 'em Up For That Great Memphis Flavor! First, season each slab with about a teaspoon of kosher salt. Then coat the slabs with flavor, using about one tablespoon of Memphis rub on each side. Wrap in plastic wrap or foil and let it rest in the refrigerator for about an hour while you get the smoker going. 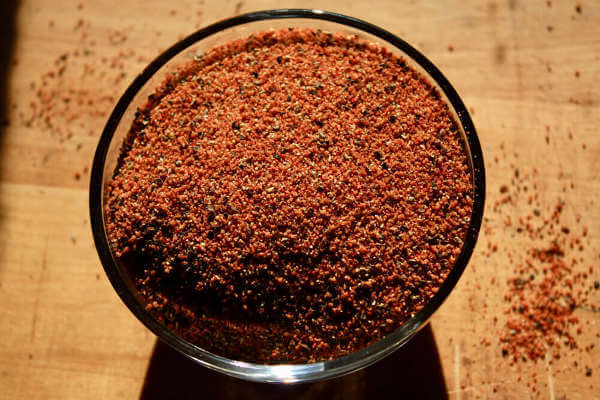 The spicy flavor of the rub will absorb into the meat - not deeply, but every little bit helps! 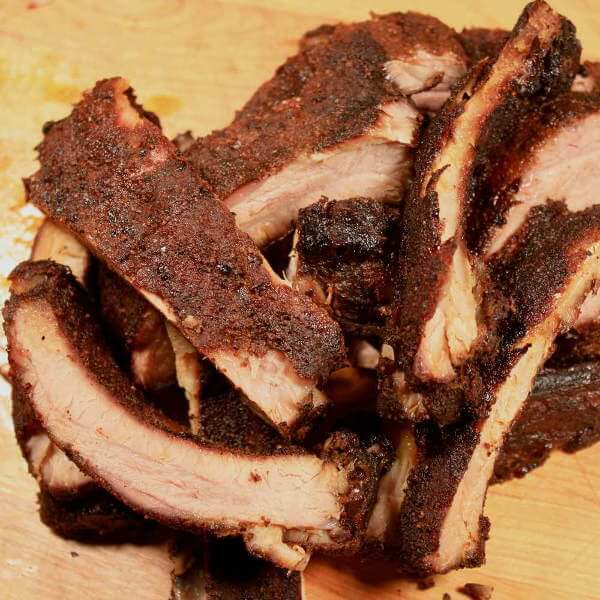 Smoke Those Memphis Style Pork Ribs! For authentic flavor, hickory is the smoker wood of choice. 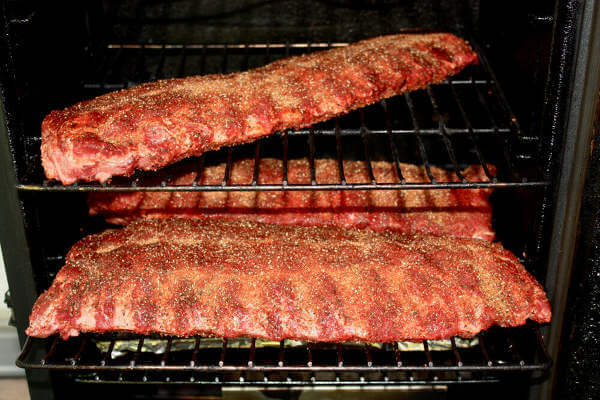 Smoke the ribs at 225° to 240° Fahrenheit for 4 to 6 hours, or until the bone will just separate from the meat. Perfect Memphis style pork ribs will have a slight crust on the meaty side when they are perfectly done. Those Are Some Good Lookin' Ribs, Man! After taking 'em out of the smoker and letting them cool for a few minutes, I sliced up one of the Memphis rib slabs and started chowing down. Luckily, this time I took a picture before I started shoveling them in. They're usually nearly gone before I think about getting my camera out!